Is there a more popular video game character than Mario There's A Mario Sidescroller for Wii You Haven't Played Yet. Seriously. There's A Mario Sidescroller for Wii You Haven't Played Yet. Seriously. Get your Wii out of the closet: some Mario fanatics put together the best fan-made Mario game in history. Read More ? Nintendo’s plumber has seen and done it all in the gaming world A Beautiful Retelling of the History of Donkey Kong A Beautiful Retelling of the History of Donkey Kong Read More , and he shows no signs of slowing down! Today, we’re going to take a look 3 different Super Mario infographics that’ll fill your head with all kinds of information. You’ll be an expert! First, we have a quick look at Mario’s history told through a family tree Research Your Family Tree Online Research Your Family Tree Online Various specialist software tools are available to help you to map your family tree and there are websites available that can help you out with everything from census results to finding graves. Read More . It’s a fascinating way to learn where he came from! Next, we have an infographic with info straight from Mario’s creator! 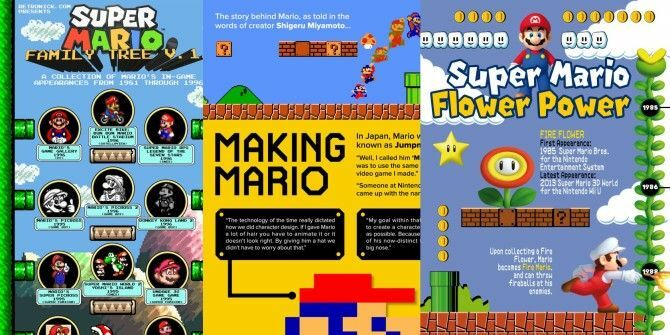 The last one we’re going to look at is all about Mario’s flower power. There’s a lot more to those fireballs than you think. Learn Pokemon Go Safety in 15 SecondsWhoa, The World’s Most Expensive Building Costs How Much?